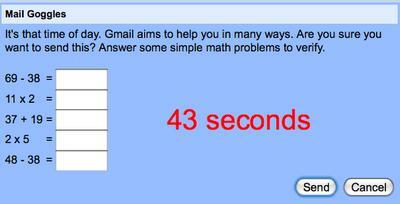 Here’s another great idea being tested by Google Labs. As many of you may know from bitter experience, the well-known phenomenon of "drunk dialing" has been partly replaced by drunk emailing, although the latter is worse because the email evidence of your indiscretion will likely be preserved forever on a server somewhere. And as we have seen before, regrettable emails have continued to haunt many people, including attorneys, even those who were presumably sober at the time they wrote and sent the message. See, e.g., Exhibit A (lawyer’s dry-cleaning email circles the globe); Exhibit B (unfortunate comments about boss); Exhibit C (new attorney changes mind about job, smarts off to employer); Exhibit D (UC Berkeley accidentally tells thousands of students they have been rejected). All of us, therefore, could probably benefit from "Mail Goggles," the new feature designed by Google engineer Jon Perlow. If you use Gmail and enable Mail Goggles, a window will pop up that requires you to solve five simple math problems before you can send the email, to slow you down and give you a chance to think. It also reminds you why you thought this was a good idea in the first place by asking, "Are you sure you want to send this?" By default, the software is active only from 10 PM to 4 AM on weekend nights, "as that is the time you’re most likely to need it." But once enabled, you can change that setting, as well as the difficulty of the problems you are required to solve before that email can go out. Personally, I would have been better off on numerous occasions had this been available in the past on our firm’s email system and enabled 24/7. The name, of course, is derived from "beer goggles," although that term refers to a condition that may make you more likely to do something you may regret later, not a measure designed to prevent that from happening. Still, given the fact that this idea could save civilization, or at least a number of jobs, there is no point in quibbling about the name.